Our trek through Alaska went south (literally) when we entered the Kenai Peninsula aka Alaska’s playground. Our first stop was Girdwood, a little ski town just south of Anchorage. We hiked the Winner Creek Trail, crossed a river using a hand tram and boondocked in the resort's overflow parking lot. The next morning, we treated ourselves to breakfast at Silvertip Grill before heading to Ninilchik. Ninilchik is a popular fishing area on the west coast of the peninsula that promised spectacular views, salmon fishing and razor clamming. We found a campground online that boasted a beach with a robust bald eagle population. However, we forgot to take into consideration that it was Memorial Day weekend. 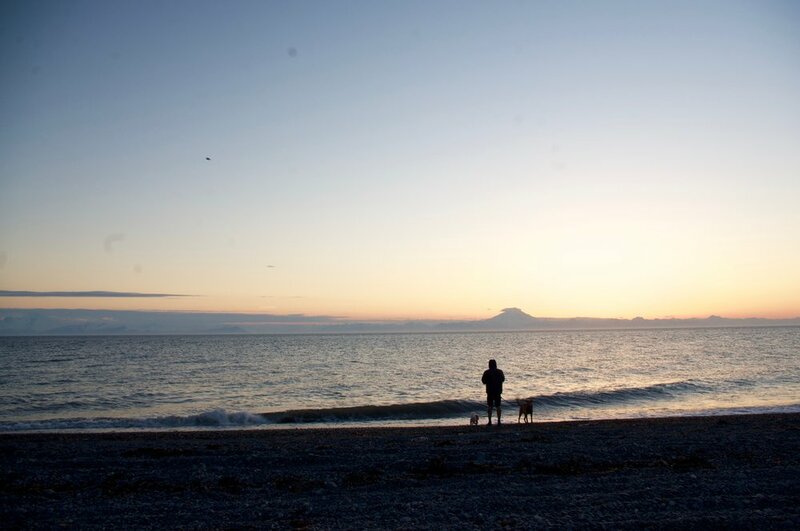 Since the majority of Alaskans are into outdoor activities, it came as no surprise to find the beachside campground we hoped to call our own packed with RVs, trailers and tent folk similar to ourselves. The area was busy. Not just with campers, but also wildlife and fly fisherman angling for salmon. Many people had their boats with them to take on the ocean for fishing as well. The beach was covered in dead fish, bald eagles and ATV’ers. There were the most bald eagles I have seen in my life so far. In the sky, on the ground, prowling. We had to keep an eye on Bosley to make sure he didn't get snatched up. Since Alaska has the 24-hour sunlight policy, the party never stopped (for everyone around us). Fishermen stood in the river all night long, and people had campfires going throughout the “night”. If we had fly fishing rods, ATVs, a boat or a dirt bike, it would have been an amazing day. However, we had none of that. Although the beach gave us a great view of a mountain range across the water, we decided to leave after one night. When we left in the morning, we weren’t totally sure where we would stay, but we had a very specific itinerary for our time in this area. Leaving Ninilchik gave us an extra two nights to spend wherever we wanted before we went to Seward. We had passed some nice looking sites on our way to the beach that we would pass on our way to Seward. After driving through a few campgrounds, we finally found a nice site on the gorgeous Kenai River. Similar to the lake, the river was an icy blue. It flowed with gusto. Definitely too strong for Mila to swim in. It was a nice place for us to spend a day relaxing by the river and soaking up sun before heading to Seward to climb the feared Exit Glacier.